Murphy’s Law seems to have followed us from house to house for as long as we can remember, with events ranging from the insignificant: there’s no bed in your hospital room and the student nurse tells you that you’re her second admission (ever!) and then proceeds to write the wrong information on your chart – to the mildly worrying: a fierce storm rips up sections of the highway and blows it away like pieces of paper, leaving you contemplating how to get past the roadblock in order to commence work that day – to the ridiculous: Kaye’s name gets taken off the electoral roll for “sedition and treason” (not a good look for a polling place manager!). The latest example would have to fall into the third category and defies belief even for seasoned Murphy’s lawyers. With just over a month to go to complete tenure and looking forward to returning to the coast to an accepted position at Forster, Nigel noticed an ad on the Lateral Transfers Vacancies List for a lock up keeper’s position at Bulahdelah. 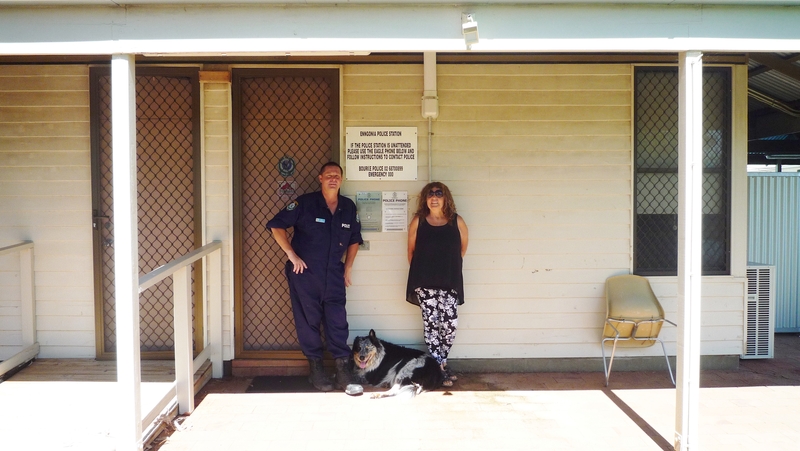 Bulahdelah is a semi-rural community and the position comes with a residence so, after 5 years of rural policing it’s pretty much Nigel’s dream job. He loves the pro-active side of the job where you’re not just another cop arresting someone. People get to respect and trust him. Plus, he’s bloody good at it! But in order to ever get that job, there were so many factors that had to fall into place that we hardly dared to contemplate it. For a start, the existing lock up keeper had to be transferred (or accept a promotion) at the exact same time that Nigel had finished tenure at Enngonia (any earlier and he wouldn’t be eligible and any later and he’d already be working at Forster and therefore ineligible to apply for another three years). Then Nigel had to actually notice the ad on the Police Lateral Transfers Vacancies List (because there are no email alerts) and then he had to apply and win the transfer, remembering that it’s a sought-after position, advertised state-wide and therefore can’t necessarily just go to the next special remote cop coming off tenure. Nigel hadn’t actually taken up the position at Forster and so he emailed Local Area Command to confirm that he was eligible to apply for the job. The reply came back – Yes, but don’t withdraw from the Forster transfer until the Bulahdelah transfer is secured! So to cut a long story short-ish, he applied and won the position and on Monday he received a phone call to say just that. On Tuesday, Nigel received another phone call apologising that there’d been an error and he should never have been allowed to go for the job because he already had secured a position at Forster. So Nigel went from excited about the new posting to deflated that he was no longer eligible – within 24 hours – which has to be the shortest permanent position on record – all because he didn’t withdraw from the Forster job. Remembering that both Commanders (Darling River and Manning Great Lakes) were in favour and fully supportive of the move, surprisingly – or not – it was the Transfers unit that overruled them. (Ah Yes, we all have stories to tell about dealing with Government departments). Enter the NSW Police Association (PAN) and at this stage, we have no idea whether Nigel will be starting work at Forster or Bulahdelah. The removalist can’t be cancelled and so the only thing we know for sure is that we’re leaving here on Monday….. or maybe Tuesday, depending on how fast they pack. And on a different note and in honour of our departure, the previously non-existent Warrego river is now flowing past our back door (almost) bringing much needed life to the town, complete with bush cockroaches, spiders, frogs, centipedes, snakes and mozzies. A good time to be leaving indeed! 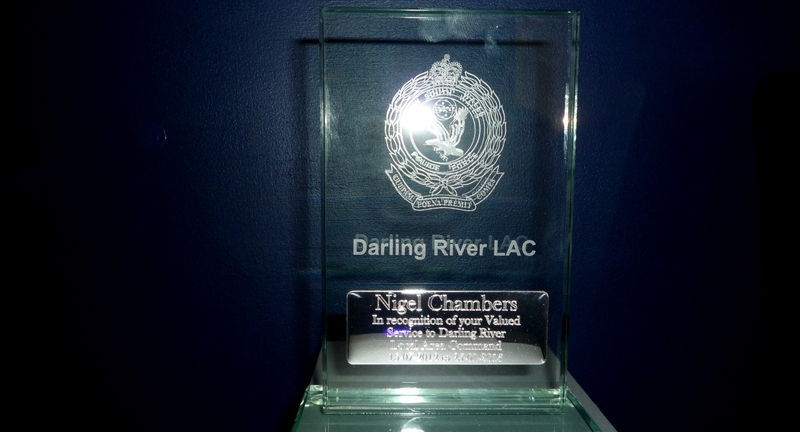 PS The Commander has just presented Nigel with a beautiful “memento” of his service in Enngonia (see photoJ). Talk about highs and lows! Next Next post: Now you see it! Now you don’t! Now you do!